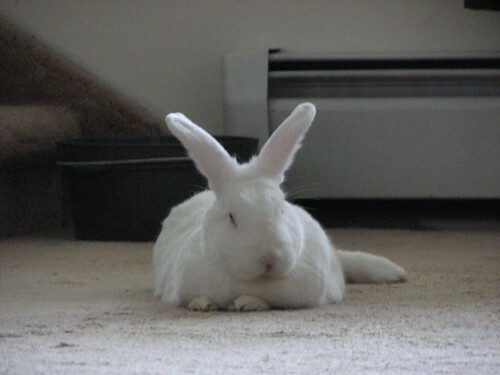 Sometimes I just like to lounge around. Y’know, just relax while dad’s off working in another room. Unfortunately, dad never turns up an opportunity to annoy me with the sound of his camera (or that little green light it flashes when it auto-focuses). ANNOYING! Fortunately, I was able to give dad the disapproving look he deserved for disturbing me. Maybe next time he’ll think twice before snapping my photo! 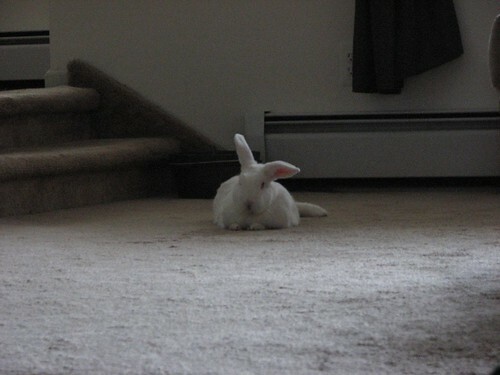 This entry was posted in Bunny Life, Pictures and tagged gus, human behavior on December 13, 2008 by Gus. You look very comfortable and relaxed. The human should leave you alone! SOMETIMES? SOMETIMES GUS? You are almost ALWAYS lounging around. Wow, that is some look! Dad must be really afraid to bother you now!